Source: DC Department of Health Zika virus information web page. The DC Department of Health (DOH) offers a wealth of mosquito-related information, including how to protect yourself from mosquito bites and how to help reduce the mosquito population. Click here for the "Mosquitoes: What to Know" fact sheet. DOH will host community events in all 8 wards on Saturday, July 16, from 10 am–1 pm, on protecting yourself and others from mosquito bites this summer. In addition to educational materials DC residents will also receive mosquito protection kits; the first 50 attendees at each event will get free emergency preparedness backpacks. Ward 2's event will be held at Stead Recreation Center at 1625 P Street NW. Questions about this event? Call 442-5833 or email mosquito.info@dc.gov. 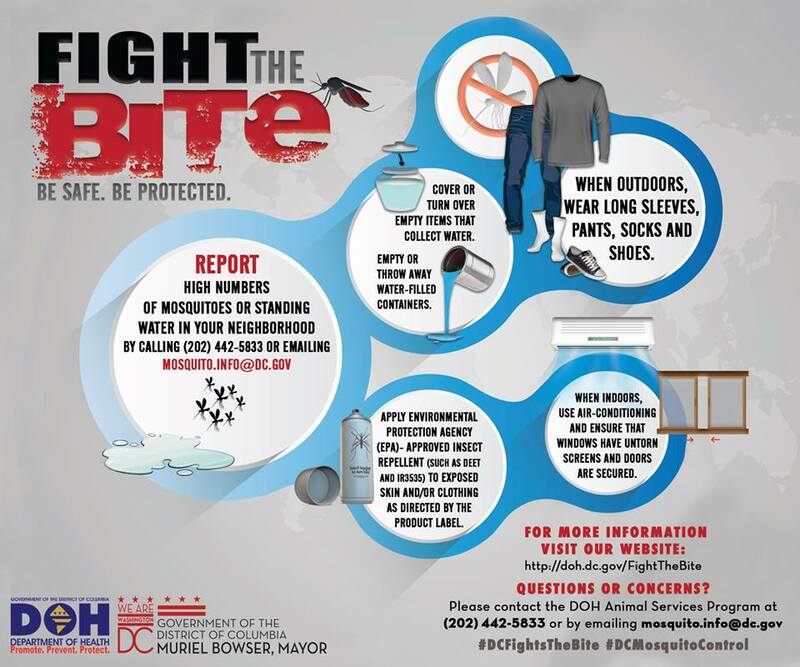 Follow the DOH's mosquito control efforts on social media using #DCMosquitoControl and #DCFightsTheBite.